« Your Brain is Like a Nuclear Reactor. Avoid Meltdowns. Keep It Cool. 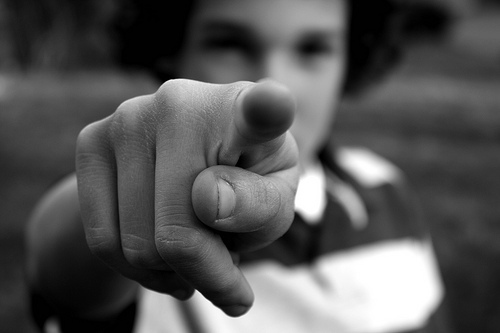 Stop Pointing That Finger: Why You’ll Never Figure Out Who’s to Blame. Today we ask that you accept the things that happen to you, even if you don’t like them. There is a tendency, when you experience an undesired outcome, to sit brooding over the event. The main question that is asked is: who is to blame? Depending on the kind of person you are, you may be more apt to blame other people or external forces, or you may tend to internalize blame and fiercely criticize yourself. Usually, both external and internal blame is assigned. The reason you do this is because you believe that by assigning blame, you can “learn from your mistakes” and prevent similar incidents from occurring in the future. In this way, you will gain greater control over reality, and ensure that life turns out the way you want it to. You will be protected from future disappointments, and ensure your security. The problem here is that none of that reasoning, as logical as it may seem, is remotely true. Things happen because they happen. You cannot control reality, no matter how hard you try. Attempting to figure out why things happen is impossible in your current state of existence. Imagine that you have a pet dog or cat that has injured himself. You take him to a veterinarian, where he receives treatment. Later, he is released into your care, but is required to wear a cone around his neck until his injury is healed, to prevent the animal from biting or irritating his injury. From the animal’s perspective, this is a series of utterly horrific, terrifying events. The animal is brought to a strange, frightening place; poked and prodded by strangers; and when he returns home he must wear this awful thing around his neck that prevents him from seeing or moving around properly. Of course, you know better. You know that all these steps are necessary for the animal to be healed. Now, if the animal had a human-like mind, he might come up with all kinds of theories about this experience, and look to assign blame. He might believe he is being “abducted by aliens,” when he is at the vet. The cone around his neck is some sort of alien device. And clearly you, his owner, are in on this terrible conspiracy! Fortunately, animals do not think this way. They simply experience things as they happen, and they do not assign blame. They know how to shake off traumatic experiences and not let them linger. When you attempt to figure out why bad things happen and assign blame, you are like a dog who believes that a veterinary hospital is an alien spaceship. You do not, in your current limited state of perception, have enough information to figure out why things happen the way they do, let alone assign blame. This is not to say one cannot “learn from mistakes.” Certainly it is not wise to stick one’s hand into a fire over and over again. But the basic learning process does not involve blame, shame, guilt, or recrimination. You must let go of your sense of injustice, victimhood, and outrage that reality isn’t the way you think it ought to be. Just accept what happens, and get on with things. Do not linger in your anger and outrage — that only prolongs the trauma. Do not try to figure out who is to blame. Just deal with situations as they arise in the present moment. You will be much happier, if you do.